Stockton Forklift Training Can Get You Ahead! Home to the largest inland seaport in California and surrounded by a rich agricultural area, Stockton offers tons of opportunities for certified forklift operators. Large employers in the Stockton area cover a wide range of industries, including electronics, aerospace, food, education, distribution, automotive, and building products, to name a few. 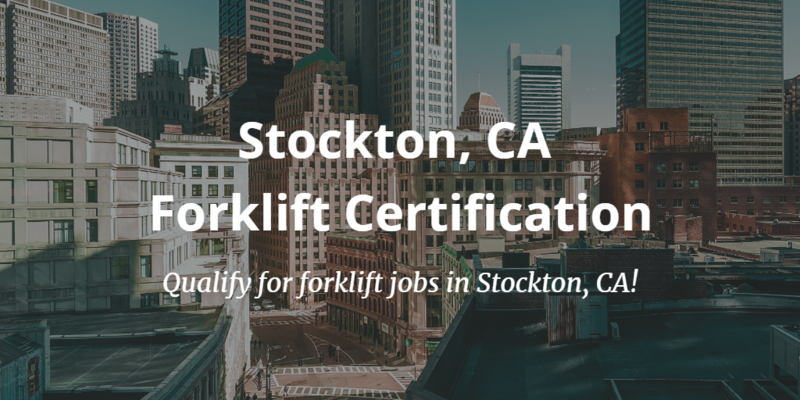 For someone with OSHA compliant forklift certification, Stockton, CA provides a wide range of jobs with highly regarded employers. Situated in the fertile San Joaquin Valley, the Port of Stockton boasts first class warehouse storage and handling facilities for both dry and liquid materials, and those with forklift certification in Stockton CA are always in demand. The hub of four major freeways, two transcontinental railroads, an international waterway and a regional airport, Stockton is ideally located to offer tremendous job opportunities in shipment and storage. For those with the proper forklift training, Stockton CA can be as prosperous a place to work as it was during the gold rush of the 1850’s. With so many job possibilities in the Stockton area and throughout San Joaquin County, it helps to have the most up-to-date, OSHA approved forklift training. CertifyMe.net has six different forklift certification courses in Stockton, CA. Classes 1, 4, and 5 are for standard forklifts, while classes 2 & 3 review important safety concepts regarding pallet jacks and similar equipment. Class 7 provides heavy-duty forklift training in Stockton, CA. And don’t forget our popular Train the Trainer course – this exclusive class gives any forklift operator in Stockton, CA, the ability to become their company’s primary OSHA training resource. One of the biggest employers for individuals with forklift certification in Stockton CA is the Port of Stockton, which offers an excellent benefits package, paid vacation and sick leave. The career page for the Port of Stockton frequently posts new job opportunities, where you can apply directly to their human resources department. Family owned Niagara Bottling is the largest private label bottled water supplier in the U.S., and one of their busiest plants is located in Stockton. If you have forklift training in Stockton, CA, you could potentially join their manufacturing and shipping team and benefit from competitive compensation, a benefits package and a positive work environment. Check out the Niagara career page to learn more about potential openings. Surrounded by the busy agricultural area of the San Joaquin Valley, Stockton offers a bounty of shipping and storage job opportunities to move those tons of fresh fruit and vegetables. With forklift certification in Stockton CA, you could be working for any number of produce distribution companies, including Morada Produce, and O-G Packing and Cold Storage Co.
And for the massive Walmart Supercenter in Stockton, forklift certification is always in demand for jobs in their warehouse and distribution center. With lots of opportunities for growth, additional training and a particular support for those who have served in the U.S. Military, Walmart is an excellent option for individuals with forklift training in Stockton, CA. 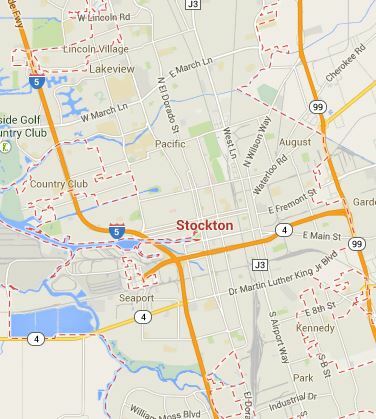 Those are only a few of the job opportunities in Stockton, CA. With California’s growing economy, the Central Valley’s surging economic output, and a positive outlook for San Joaquin County, the future looks bright for all well-trained operators in the area. Don’t skip on safety – it always pays (literally) to enhance your credentials. With our forklift certification in Stockton, CA, you’re in the driver’s seat for your career! Whether you have recently moved to Stockton, considering making the move, planning a career change or want to move ahead in the shipping and distribution world, getting certified with a Stockton forklift training program is the best place to start. Jump start your career, earn a higher income and reap the benefits of forklift certification in Stockton, CA. Employers are looking for forklift operators with the proper OSHA certification to ensure a safe working environment and a dedicated workforce. Learn more about forklift training in California! Get signed up today with our forklift training in Stockton, CA! For any questions about our OSHA forklift training packages in Stockton and surrounding communities, call CertifyMe.net at 1-888-699-4800.